You’ve Seen the Web Site – Now Buy the Best Selling Book! “Delicious & Simple Recipes – Straightforward Guides” – Signed by the author! 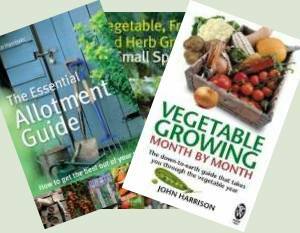 Thanks to Suttons Seeds we can offer you £10.00 worth of seeds with this book, absolutely free. 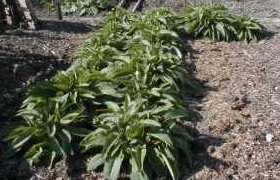 We’ve a wide range including Spring Onions, Lettuce, Rocket, Chilli & Sweet Peppers, Cucumber, Garlic Chives, Tomatoes (5 different varieties) and more. We’ll pick packets to the value of £10.00 to accompany your book and get you off to a good start. If you order 2 or 3 qualifying books together we will try to ensure you get different varieties and avoid duplicates as far as we can. From the author of one of the UK’s best selling gardening books, this collaboration with his wife brings their favourite recipes to you. Like all our books; it’s straightforward, tested and practical. Did you know they go back to Roman times! Sometimes it just doesn’t work out, but you can often rescue your jam. Includes how to make your own sweets.. not for the kids either! What sorts to use and how they affect flavours etc. Like jams, sometimes it doesn’t work but you can often rescue your preserve. Quickly find the bit you need. I’m not much of a chutney maker usually but I’ve had to rearrange my kitchen cupboards to store all the stuff I’ve made from this book. Good, clear instructions and quite a range of things to try. A godsend in the middle of an allotment marrow and tomato glut. 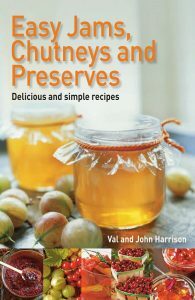 It would make a great present too – as do the jars of chutney! I might branch out into jam soon. John and Val Harrison clearly know their stuff. An informative book based on lots of practical experience and with loads of top tips, as well as a wide range of delicious recipes. It will be in constant use, complementing John’s vegetable books! I bought this book early in the preserving season and find it straight forward and easy to follow, it’s brilliant value for money too. I can now reliably make jam that sets! What a book!!! From the time it arrived I haven’t put it down! I’ve never made jams, chutneys etc. before but can’t stop now. This book makes it so easy. Takes all the fear out of jam making. I think it's just great. Another down to earth book for down to earth people, teaching not preaching how it's done. Forget about any glossy pictures, what's in this book is solid words of advice, written in plain to understand English from a grower who's had frustrating years of experience behind him in trying to grow nutritious vegetables, whilst at the same time running a business and raising a family. I've never made jams, chutneys etc. before but can't stop now. This book makes it so easy. Takes all the fear out of jam making.